The thing I love about quesadillas is the versatility… nothing really has to be measured out — vegetables and meat can be added or omitted. 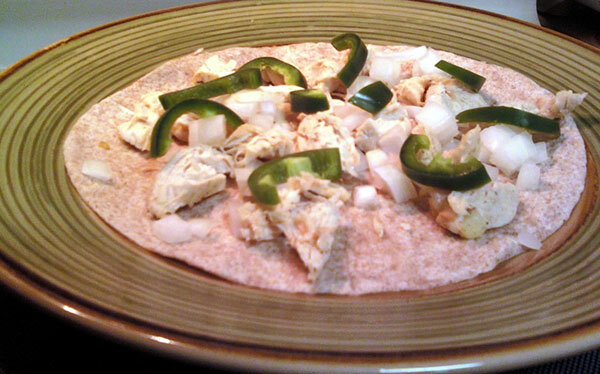 This is a great meal for less than $2 a person, which is perfect for our budget. My husband and I opted for whole wheat tortillas and fresh vegetables. Grill thin slices of chicken or beef, if using. I sprinkled the chicken with a bit of leftover taco seasoning to spice it up a little (a great seasoning recipe can be found here). Chop all vegetables into ¼” pieces. Start with one tortilla per person. Lay out meats and vegetables evenly within a half inch of the edges. 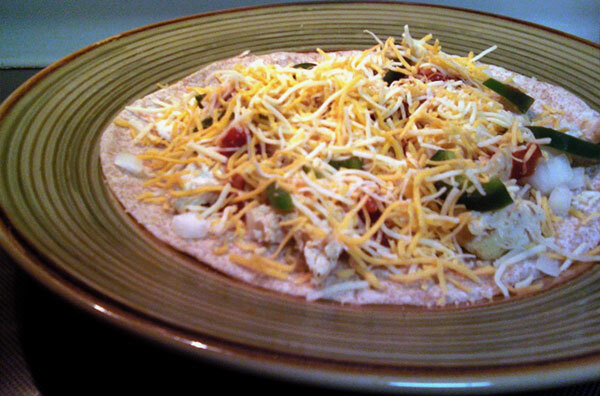 Sprinkle cheese over top, and place second tortilla on top. 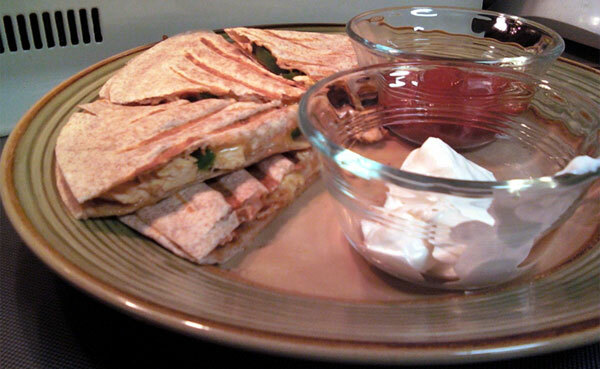 Heat a panini press (or a nonstick pan or griddle) on medium heat, and heat quesadilla until cheese has melted and bottom tortilla has slightly browned. Carefully flip the quesadilla over to heat the other side, if necessary. Use pizza cutter to cut into 6-8 slices. One of the best vegetarian fillings that I love is the spinach. My distant second vegetarian favorite is mushrooms. Sheila, quesadillas look yummy. I am going to try make them. I love quesadillas as well. My suggestion is to add little bit of seasoning (sauce)coating inside the tortillas. Examples are thin layer of bbq sauce, honey mustard sauce, fresh salsa, chili sauce, chutney. Make sure not to add too much because it will make quesdillas too soggy.